Ideal for those with little baggage (eg: Opel Corsa or Opel Agila). ideal for family, good baggage capacity (eg: Opel Astra SW or sedan). 4 adults and a good storage capacity (eg: Opel Zafira). Ideal for large group (eg: Opel Vivaro Tour). All the rental cars come equipped with front seat side-impact airbag, twin front airbags, ABS, power steering, air-conditioning, power windows, remote control central deadlocking and radio. 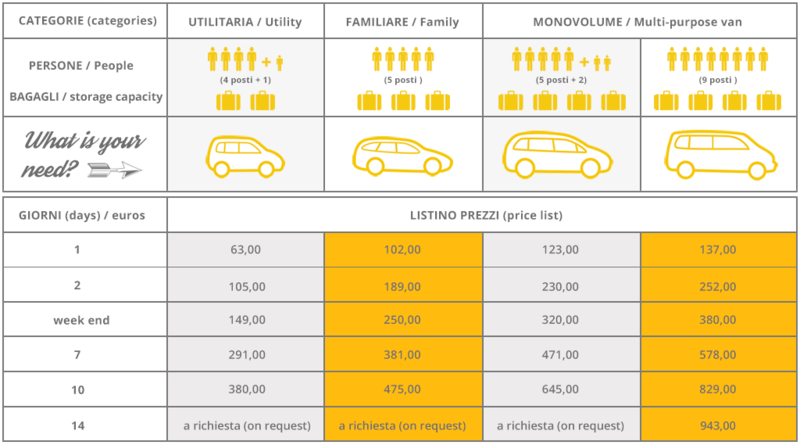 Also included in car rental package: unlimited mileage, civil liability autro insurance and Europ Assistance which has a toll free number in caso of emergency in Italy or abroad for the recovery of vehicle on urban roads or highways. The price includes: personal and civil liability insurance towards third parties up to Euro 5.000.000,00 with excess up to Euro 1.000,00. The Chianti is the region between the cities of Florence and Siena and it is the same geographical area of the famous wine production. The car is the better vehicle to visit the Chianti region, not because of distances that are short, but for the freedom that this vehicle allows. You can visit the picturesque villages rich in history and culture, admire the breathtaking landscapes or stop to enjoy one of the many typical Tuscan products, with a good glass of Chianti wine. The Valdelsa is the valley situated at the border of Chianti and it is historically important because crossed by the international way of communication that connecting France to Rome, the “Via Francigena“. The heart of the Elsa Valley is Certaldo, the country where Boccaccio, one of the greatest Italian poets of the fourteenth century, he was born and died. The Val d’Elsa is an excellent base for visiting Tuscany by car.